When we think of the Reformation, we usually think of Martin Luther’s profound realization that people cannot work their way to Heaven. After more than a thousand years of existence, the Catholic Church had deviated tremendously from the Bible. In fact, Church tradition and Church doctrine almost completely replaced the Bible. The largest casualty of this deviation was the salvation message. The true message of salvation was almost completely lost. The Church’s plan of salvation had completely disintegrated to the point where the priests were telling people they could get to Heaven with doing good works and donating large amounts of money to the Church. They would say, "As soon as your money hits the offering plate, the soul of your dead relative will immediately leave Purgatory." Shortly before the Reformation, a couple of things had happened. First, some "radicals" had translated the Bible into a language that could be read by the common people. Up until then, only the priests had access to the Bible. This allowed people to be able to read the Biblical plan of salvation for themselves. Second, some of the priests started studying the Bible themselves (which was uncommon at the time). As they studied the Bible, they began to realize the Church was teaching a false plan of salvation. They realized the Church was leading its flock down a path of destruction. Martin Luther was one of these priests. He had spent most of his life trying to please God with good works, abstaining from pleasurable activities, and doing penances that were painful and life-threatening. He felt he could only please God if he suffered greatly for his sins. Many of his friends thought the punishments he was inflicting upon himself would eventually kill him. One day the verse Romans 1:17 ("The righteous shall live by faith") made perfect sense. He realized a person is not justified in God’s sight by sacrificing or doing good works. Rather, a person can be justified only by having faith in what Jesus had done on the cross. A person is justified by faith, not works. One thing led to another and the Reformation erupted. The Reformation causes a problem for Selective Salvationists. If selective salvation is true, then people were getting saved all along. If selective salvation is true, the message of salvation couldn’t have been corrupted. There was no need to proclaim the forgotten message: "The righteous shall live by faith." 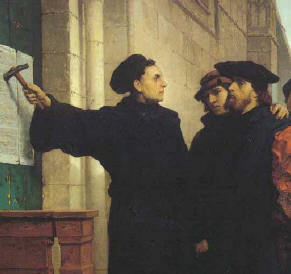 If no one was being misled by the false plan of salvation, there was no need for the Reformation.